« An All-in-One Site for Ergononomic Info! I broke out our Wii the other day and my boyfriend and I played some Wii tennis and bowling. 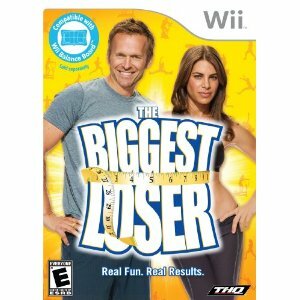 While Wii Sports can be fun, they don’t provide as fun or as active of a workout as Wii’s The Biggest Loser does. For fans of the Show, you may be familiar with some of the trainers and advice. However, the game itself looks like a lot more fun than the standard Wii Fit or Wii Fit Plus workouts. To check out the video of the same showing some of the exercises and visuals, go to the Amazon webpage and click on the video. The game is available from Amazon. com for about $15.00. Click here to order from Amazon. Note: You will need to purchase or own a Wii Balance Board to use this game. A daily calendar for day planning and 50 healthy recipes from The Biggest Loser Cookbook. Option of a 4, 8 or 12 week program with avatars of contestants from the prior seasons of The Biggest Loser. Multiplayer functionality allows you to train with a friend and compete in weekly challenges. Fitness Program – This is where you establish your goals, make a plan and compete for the title of The Biggest Loser. Pick from a 4, 8 or 12 week programs. Health and Lifestyle Tool – Encouragement and tips from former Biggest Loser contestants and trainers, and some of the best recipes from the Biggest Loser cookbooks. Exercise Routines – Select from a collection of routines that match your skill level and let you focus on every part of your body. Through it you can also create your own routine that fits your schedule and focuses on your favorite exercises. Challenge Events – Take the exercises you’ve learned and put them to the test in a series of fun but competitive events against some of the former contestants that you’ve seen on The Biggest Loser show. In Single Exercises, you can find your weakest exercise and conquer it or refine your technique to get the most out of your time.